directly or through subordinate officers in accordance with the Constitution. 2. The President appoints the Prime Minister and other ministers; and they hold office during his pleasure. 3. 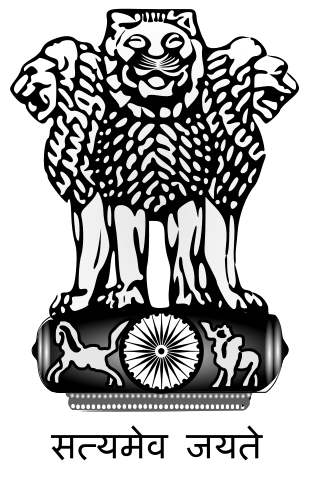 The President appoints the Attorney General of India, Comptroller and Auditor General of India, the Chief Election Commissioner and other Election Commissioners, the Chairman and Members of the UPSC, the Governors of the states, the Chairman and the members of the Finance Commissions etc. 4. The President can appoint a commission to investigate into the conditions of SCs, STs and OBCs. 5. The President of India can grant a pardon to or reduce the sentence of a convicted person for one time, particularly in cases involving punishment of death. 1. The President addresses the Parliament at the commencement of the first session after the general election and the first session of each year. 2. The President can summon or end a session of the Parliament and dissolve the Lok Sabha. 3. He can also summon a joint sitting of both the houses of Parliament which is presided over by the Speaker of the Lok Sabha. 4. The President can appoint a member of the Lok Sabha to preside over its proceedings if both the positions of Speaker as well as Deputy Speaker are vacant. 5. He also can appoint any member of the Rajya Sabha to preside over its proceeding when both the Chairman’s and Deputy Chairman’s office fall vacant. 6. He can nominate 12 members to the Rajya Sabha with extraordinary accomplishments in literature, science, art and social service and two members to the Lok Sabha from the Anglo-Indian Community. 8. When a bill is sent to the Parliament after it has been passed by the parliament, the President can give his assent to the bill or withhold his assent to the bill or return the bill (if it is not a Money Bill or a Constitutional Amendment Bill) for reconsideration of the Parliament. 9. When a bill passed by a State legislature is re-served by the Governor for consideration of the President, the President can give his assent to the bill, or withhold his assent to the bill or direct the Governor to return the bill (if it is not a Money bill) for reconsideration of the State Legislature. National emergency is caused by war, external aggression or armed rebellion in the whole of India or a part of its territory. President can declare national emergency only on a written request by the Cabinet Ministers headed by the Prime Minister and the proclamation must be approved by the Parliament within one month. National emergency can be imposed for six months. It can be extended by six months by repeated parliamentary approval, up to a maximum of three years. Under national emergency, Fundamental Rights of Indian citizens can be suspended. The six freedoms under Right to Freedom are automatically suspended. However, the Right to Life and Personal Liberty cannot be suspended. A State Emergency can be imposed in a State if that state failed to run constitutionally i.e. constitutional machinery has failed. Such an emergency must be approved by the Parliament within a period of two months. It can be imposed from six months to a maximum period of three years with repeated parliamentary approval every six months. During such an emergency, the Governor administers the state in the name of the President. The Legislative Assembly can be dissolved or may remain in suspended animation. The Parliament makes laws on the 66 subjects of the state list. All money bills have to be referred to the Parliament for approval. 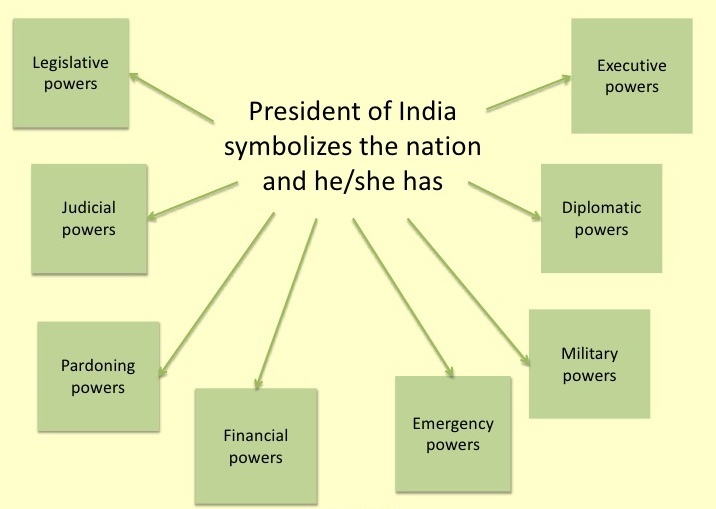 President can proclaim a Financial Emergency if financial stability or credit of India or any part thereof is threatened. This proclamation must be approved by the Parliament within two months. 2. The President lays the Annual Financial Statement i.e. the Union budget before the Parliament. 4. The President continues a Finance commission after every five years to recommend the distribution of the taxes between the centre and the States. 1. International treaties and agreements are signed on behalf of the President. However, they are subject to approval of the parliament. 2. The president represents India in International forms and affairs and may send and receives diplomats like ambassadors, high commissioners. 2. The President can declare war and conclude peace, subject to Parliaments’ approval. 3. The President appoints the chiefs of Army, Navy and Air Force. 1. The president appoints the Chief Justice of the Union Judiciary and other judges on the advice of the Chief Justice. 2. The President dismisses the judges if and only if the two Houses of the Parliament pass resolutions to that effect by two-thirds majority of the members present. 3. The president has the right to grant pardon. 6. The president is not answerable for the exercise of his/her duties.